For years, the Ouija board has been a major prop in many horror films, specifically ones that heavily feature supernatural elements like The Exorcist and Paranormal Activity, but when it comes to having a film based around its very existence, the results are not quite as rewarding, to say the least. Low-grade trash has come and gone with the board featuring front and centre, from The Ouija Experiment to Long Time Dead, but none have left quite as much a negative mark as 2014’s Ouija; produced by Michael Bay through his Platinum Dunes production company, and said to take its cues from Hasbro’s version of the game, the movie was universally hated by critics and audiences (on Rotten Tomatoes, it sits at a whopping 7%) for its low-rent scares and tropes, but still managed to make a profit of $100 million worldwide from a $5 million. As it is with many high-earning horror films, a sequel was soon in the works, which brings us here today. I must admit, I never actually saw Ouija in the cinema, primarily for the reason that I had heard so many bad things that I couldn’t bring myself around to watching it, even though it is technically my job to do this exact thing (then again, this was also the same year where I refused to watch other bad movies like Mrs Brown’s Boys D’Movie, The Other Woman and Pudsey The Dog: The Movie, so looking back I wasn’t always a solid critic when I first started the website). 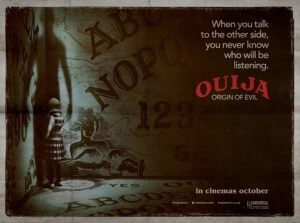 In fact, I still haven’t seen it even on DVD or on demand, meaning I went into Ouija: Origin of Evil completely cold and not sure what to expect. Now that I’ve seen it, I want to distance myself from Ouija even more, if only for the reason that I do not want it to tarnish my surprisingly strong opinions on this film, as it is a film that not only works solidly as a standalone horror film, but is also one that manages to be scarier and dramatically more engaging than many of the others I have seen this year. That comes down to the hiring of Oculus director and co-writer Mike Flanagan as the main creative force behind this film, and as with that little-seen but wildly underappreciated horror film he is able to bring the scares at a more unusual, and more effective pace. He sets the film in the 1960s – complete with an old-school version of the Universal logo, and frequent cue marks in the corner to simulate a changing reel from an old film projector – and focuses the attention on a small family, made up of recently-widowed Alice (Elizabeth Reaser) and her two daughters, teenager Paulina (Annalise Basso, aka Young Karen Gillan from Oculus) and nine-year-old Doris (Lulu Wilson). They are running a good-intentioned fake séance business in their home, to help give bereaved people a chance to say goodbye to passed ones through carefully choreographed stunts and trickery. Alice soon purchases – you guessed it – an Ouija board as a new prop for her business, but when young Doris gets a hold of it she unwittingly summons genuine evil into the home, which soon takes a hold of the young girl and uses her to exact wrath on the family and all who cross their path. Like its predecessor, Ouija: Origin of Evil’s, erm, origins undoubtedly lie in deep corporate cynicism, in this case to promote Hasbro’s own line of Ouija boards, but despite the pressures that usually come with franchise fare such as this, Flanagan has instead opted to make a film that is strong enough with its story, characters, and its scares to make it a film that exceeds its own reason for being. It takes the time to establish the set-up of this family’s situation, which is believable and even heart-warming in places, and to make sure that the characters are well-written enough for the audience to root for them against this demonic presence that is haunting them. Even minor characters, like a friendly priest played by Henry Thomas (who you may know best as young Elliott from E.T. all those years ago) and a boy at school that Paulina has a thing for, could have so easily been one-note cardboard cut-outs, but they too are given enough room to develop a good rapport with the people we’re mainly following, and they end up being good minor additions to the larger crux of the story. Flanagan paces it all steadily, making sure that even when it does use a typical horror movie trope like the loud orchestral jump-scare music (which, for the most part, it manages to avoid) it never loses sight of the characters and the story they’re trapped in. Both of them are represented by an extremely unnerving performance by young Lulu Wilson, an eerily possessed young talent who can send shivers down your spine with just a blank stare and smile, and who even when she’s moving about in the background you’re seriously disturbed by her movement that you can’t help but notice her more than what’s going on in the foreground. If scary young girls are where you draw the line in horror films like this, then you won’t be sleeping right for days. As I haven’t seen the first Ouija film, I can’t make an instant judgement that this is by far a superior product, but I will gladly take everyone else’s word for it, especially those who did end up seeing it and hated it as much as that 7% rating suggests. On its own, however, it’s a surprisingly engaging, thrilling and even rather scary film that plays things out nicely at its own pace while refusing to conform to studio mandates about how to move this particular franchise forward. I can’t say it’s the best horror film I’ve seen this year, nor is it even the best horror sequel (I still think The Conjuring 2 was a little better), but for something like Ouija: Origin of Evil to come from something so cynical to be as good as it is, is frankly scarier than the entirety of the first film (I’m assuming). Ouija: Origin of Evil is a fairly strong horror film that packs enough genuine scares as well as a well-written plot and characters you actually care about into a film that, given its corporate origins, is far better than it has any right to be.